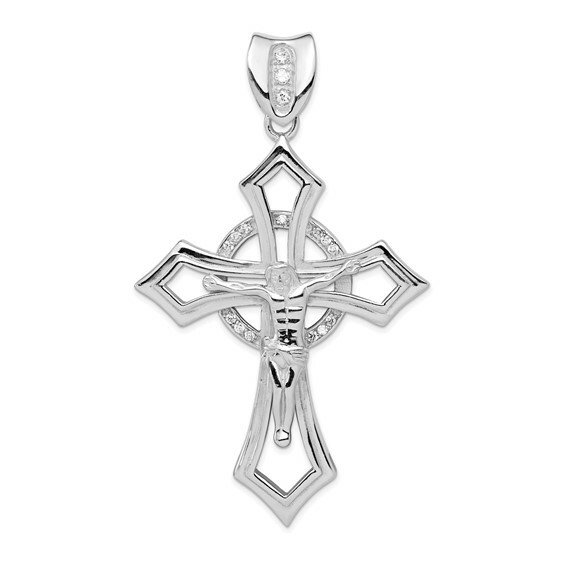 Sterling Silver CZ Crucifix Pendant. Weight: 28.53 grams. Measures 2 1/2 inch tall by 1 3/4 inch wide without bail. Chain not included. Crosses with a representation of the body of Christ, or corpus, are crucifixes and recall the death and resurrection of Christ. Please note* The circle with stones behind the cross is not perfectly centered. This is supposed to represent the rising sun.